After you figure out what destination to visit, and what to pack, you’ll need to find a sturdy suitcase – but since you’re traveling with you’re family, you’ll need more than just one bag. Your best bet is usually to get a luggage set. With that said, we’ve sorted through tons of luggage sets and have come up with this list of the top 7 luggage sets for family travel. 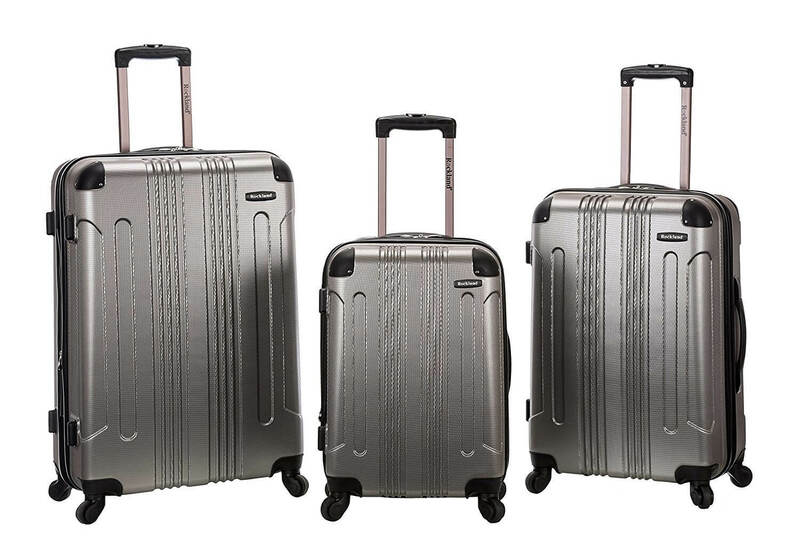 Spinner wheels, built in TSA lock, expandable main compartment and an easy-access laptop compartment – the suitcases in this family luggage set have everything you could ask for. The set includes a 20-inch carry-on, a 24-inch check-in bag and a 28-inch check-in bag. The 4 quiet spinner wheels allow you to glide across the airport easily and the built in lock means you won’t have to spend extra money on luggage locks. Not a big fan of the bright orange? Choose the grey set or the navy set. $51 for a 3 piece set is an insane deal. And it’s not like this set is made by a no-name brand either – American Tourister has been in the luggage business since 1933. I will admit, the suitcases in this set are pretty basic. But while suitcases might not have the frills of a Samsonite, they get the job done. Included in the set is a 21-inch carry-on, a 25-inch check-in bag and a wheel-less boarding bag. The two roller bags have inline skate-like wheels as well as reinforced corners to keep your belongings protected even when thrown around by rough luggage handlers. Recently we featured 8 of our favorite suitcases under $50. That writeup has since helped hundreds of travelers find the right suitcase, at incredibly affordable prices. When it comes to luggage, you can’t go wrong with Samsonite. This fashion-forward set includes a 20-inch carry-on, a 24-inch check-in bag, and a 28-inch check-in bag. 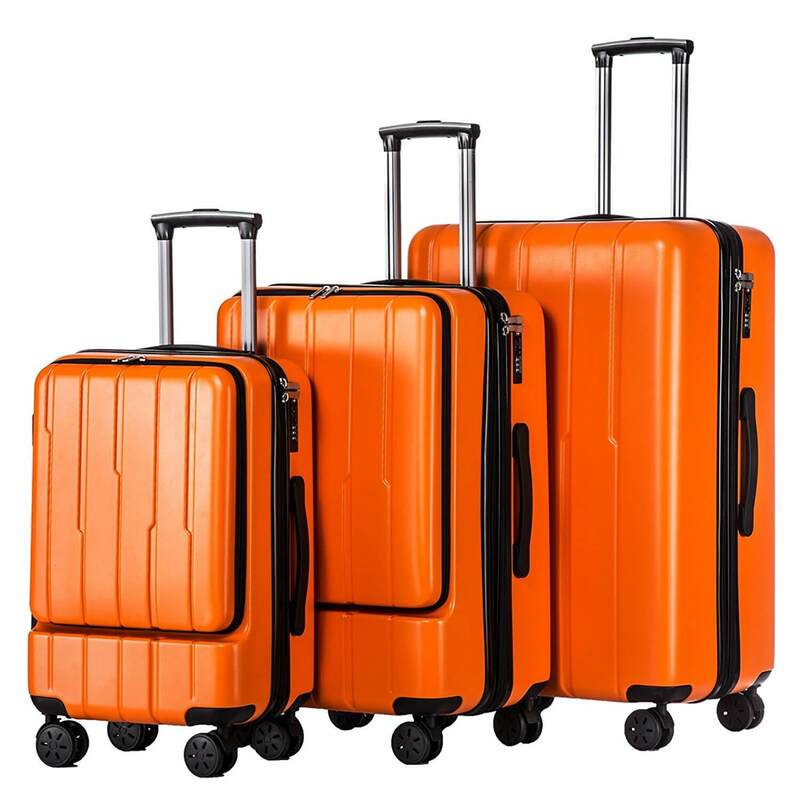 The suitcases are lightweight, well made and have a distinctive design which you won’t miss at the baggage claim. Therefore, by purchasing this set of 3, you’re saving $37. This set comes in more than just the silver depicted above – choose from purple, orange, blue, black and more. Traveling as a couple? 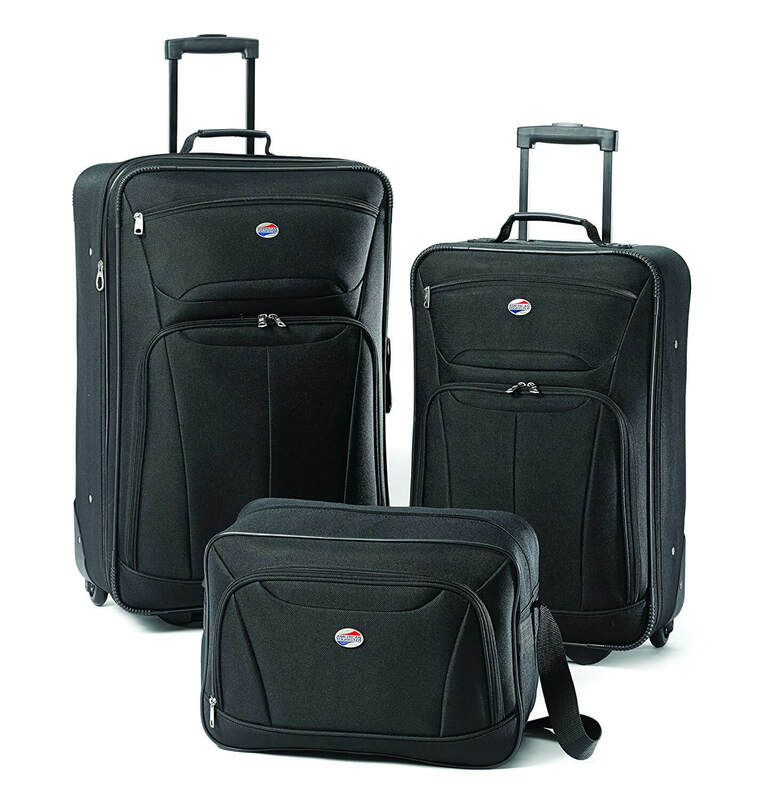 You might want to get the Samsonite Winfeld 2 piece luggage set ($183). 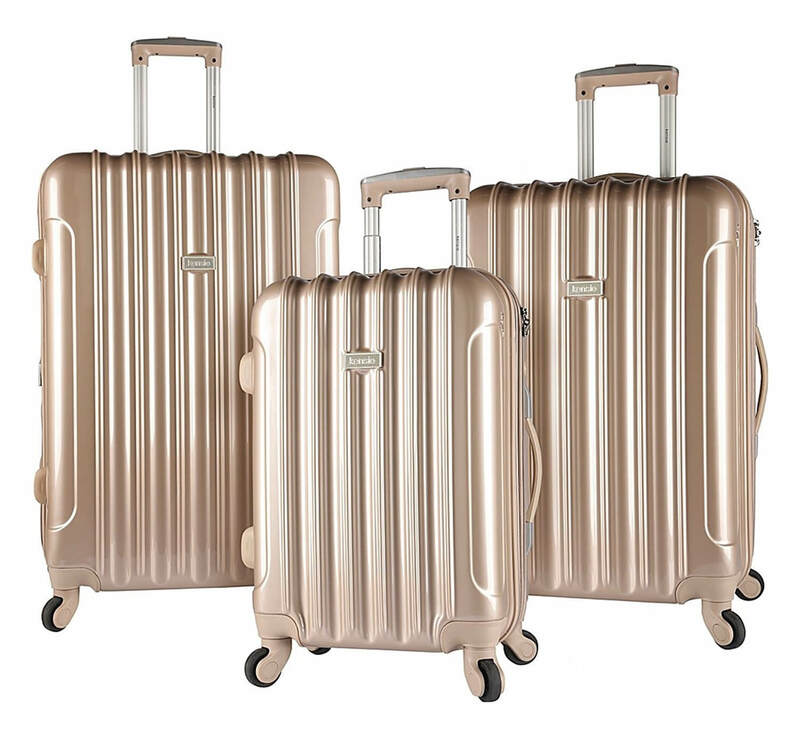 I’ve written about it luggage‘s “World’s Lightest” collection a number of times on this website for two reasons: (1) they’re very light weight, hence the name, and (2) they’re very inexpensive. The World’s Lightest Los Angeles set includes suitcases: a 21-inch carry-on, a 28-inch check-in, and a 30-inch check-in. The carry-on weighs only 3.6 pounds. In order to keep the suitcases as light as possible, they’re pretty bare-bones. You might notice upon first glance that the handles are very wide – that’s to increase usable packing space, and to reduce weight because the handles are also a part of the bag’s frame. Rolling these suitcase through the airport, you’re bound to get compliments. 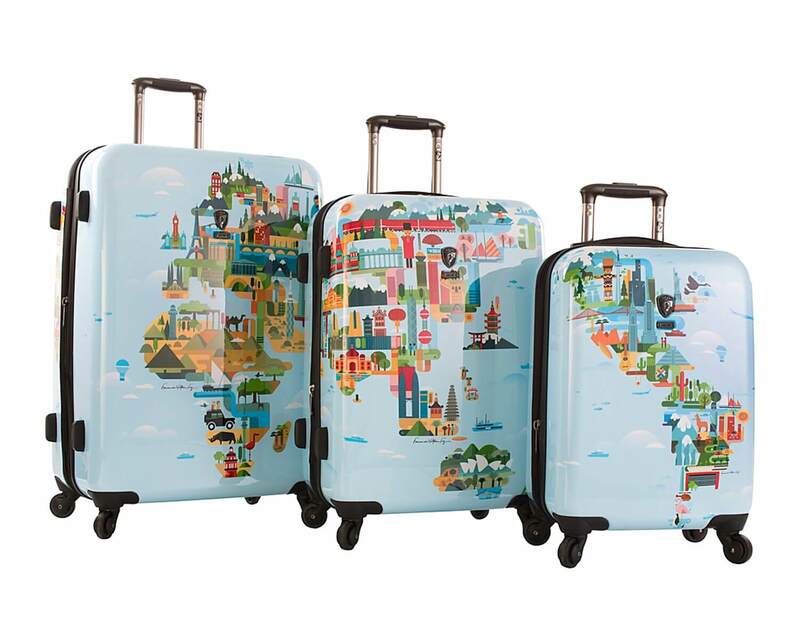 Heys partnered with Fernando Volken Togni, a Brazilian digital artist to design these suitcases. The World Map design is incredibly detailed, and with the set, you’ll be able to have the full globe – Europe and Africa on the 30-inch check-in, Asia and Australia on the 26-inch check-in, and North and South America on the 21-inch check-in. I’ve tested and reviewed the 30-inch check-in sized version of this suitcase in a slightly different design. For a more in-depth overview of this suitcase, read the full Heys FVT Luggage review. 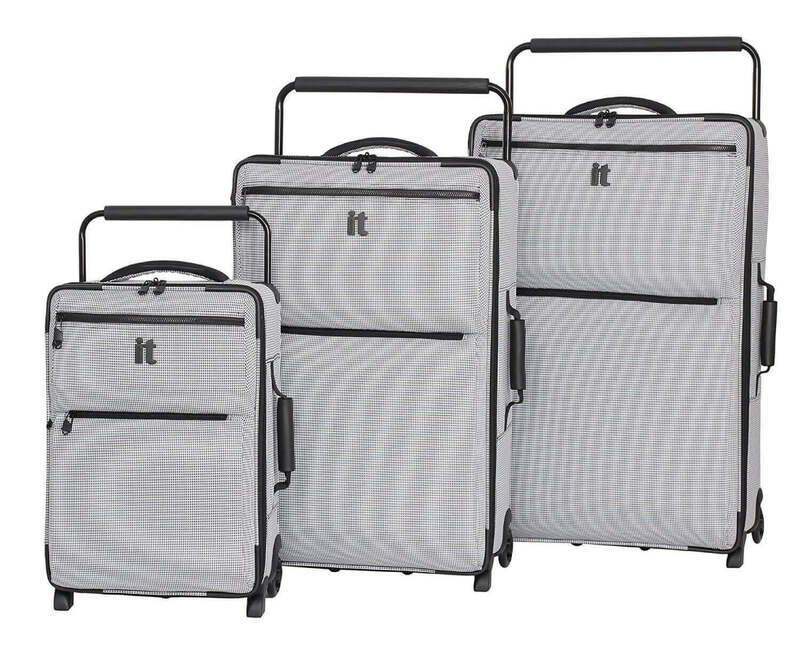 This luggage set from Kensie includes 3 suitcases – 1 carry-on and 2 check-in bags. The luggage have built in TSA locks, expandable zippers and smooth spinner wheels, but the best part is the gold exterior. Choose between the normal gold or rose gold. Rockland is known for making affordable suitcases, and costing only $72, this luggage set fits the mold. 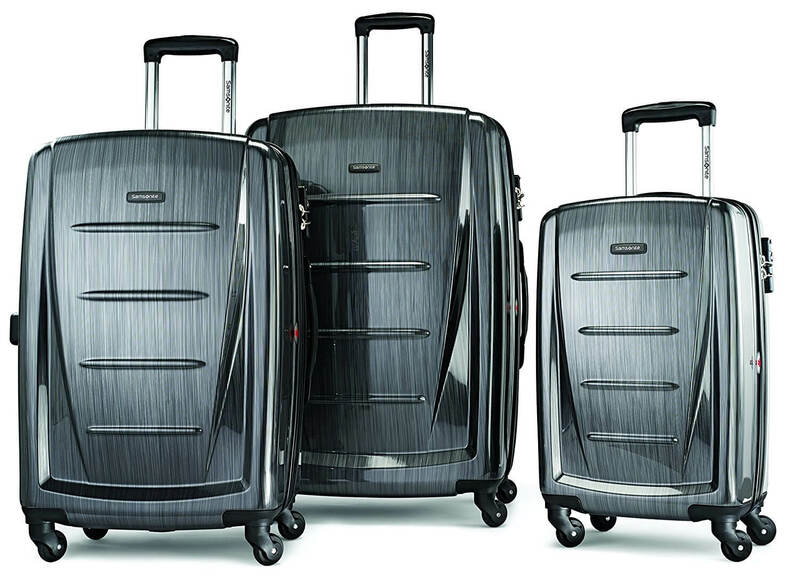 The set includes 3 spinner suitcases, a 20-inch, a 24-inch, and a 28-inch. This is well suited for families traveling overseas or even for a trip to Disney World. The Rockland luggage set comes in 19 different color options. I get it. There are a lot of randos on the internet trying to give you advice. So, how do you know I’m not fake news? I’m Jonathan – the guy in charge of Thither.com. You can read more about me on the About page. I’ve traveled around the world for 2 years with just a carry-on backpack. I’ve been in the travel gear industry for about a quarter of my life so far. (Admittedly, that’s less than 5 years). I’ve tested, used, abused and reviewed countless suitcases, most on this very website. I’ve also written about travel gear for brands and websites including British Airways and Iberian Airways. To write this piece, I spent hours of research and testing. With that, I hope you found this article useful and helpful in your search for a luggage set. If you have any comments or questions, leave a comment below and I’ll do my best to respond to you as soon as possible.